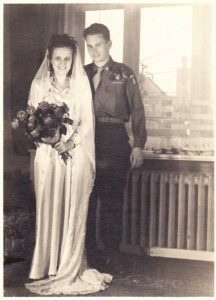 My parents on their wedding day at 106 Reichstrasse, Berlin, Germany, 1946. Dad was a handsome rascal and she was a beauty. 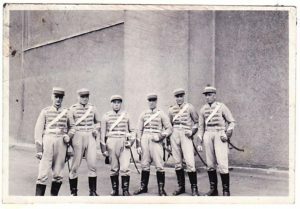 My grandfather, Georg Wilhelm Wichmann, on far left of a cast of a satirical play about the French Foreign Legion in Berlin 1936. Mom said they did a song and dance routine and was a riot. 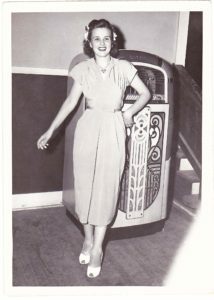 Mom sang in the NCO and Officer’s Clubs in Berlin and later in Texas in the late 40’s. 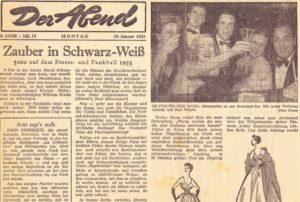 In 1953 she attended a press ball in Berlin with friends. Mom is the lady on the right flanked by her two friends, two of Germany’s motion picture stars Wolfgang Lukschy and Paul Klinger. At 73 she was still full of energy and ready for stardom. 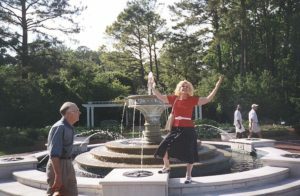 Photo taken in Williamsburg, VA with step-dad who was a local TV sports reporter and weather man. She spent most of her years as a lingerie buyer for east coast department stores and then later as Century 21 real estate agent. She passed in 2012. Bis spater Mutti. 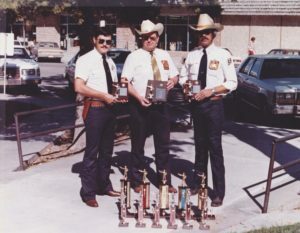 Dad flanked by his deputies that formed the Lea County shooting team late 1970’s. They won the state traveling trophy 2 years in a row. Dad and I reloaded thousands of rounds of ammo and spent a lot of time at the shooting range. Learned a lot about guns and shooting, was favorite time of my early years. Thanks Dad. 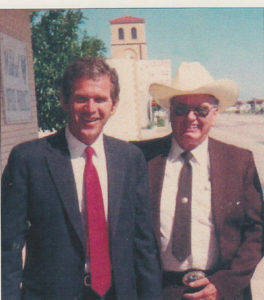 Newspaper photo taken in Roswell, New Mexico alongside George W. Bush when he was campaigning for his father for President. Dad escorted him around the southern NM cities. He said George was very friendly and cracked a lot of jokes and kept them laughing and was fun to be around. My step-mother was the County Republican Chairwoman at the time and hosted his visit. 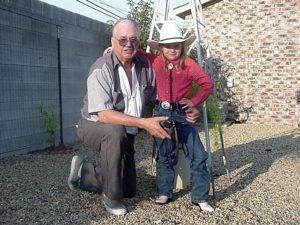 Taken at Dad’s home long after retiring with granddaughter, my Kellie, with her new cowgirl outfit complete with pink boots, studded jeans, big buckle, a silver bolo and white summer Stetson. 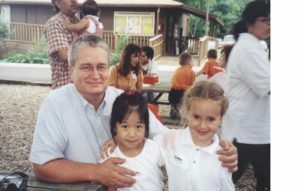 My girl Kellie with her lifelong friend Lydia at their private Christian school in Austin. Lydia’s parents are some sweet folks from Taiwan. Kellie grew up and now teaches English in Taipei, Taiwan. Mom and Kellie at their favorite hangout, the public library watching a puppet play. They both are avid readers and have given their time volunteering at our local library. Photo of Teufelsberg as it was in 1969 in Berlin, Germany where I worked for the United States Army Security Agency a division of NSA. 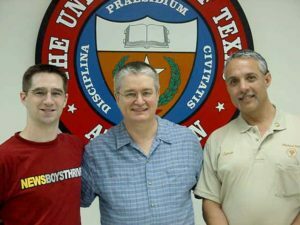 This was taken before the site was expanded and upgraded to the computer digital age. The domes were filled with a variety of powerful antennas all linked to sophisticated receiving and recording equipment in the rooms below. I started working there below the gray/white dome on the right as a voice intercept operator and later as a search operator and eventually became the trick chief of “C” trick (army lingo for shift). The site was manned 24 hours a day by 4 rotating shifts (tricks) of linguists, technicians, administrative officers and other specialists in addition to a permanent straight days shift of mostly married personnel. The dome on the left with the ball on top belonged to a British military security outfit that was a division of MI6. We rarely interacted with the Brits on site but off site were a fun bunch to associate with. I eventually graduated to the second floor of the 3 story brick building between the two domes where I transcribed taped voice intercepts from German to English. The transcribed tapes were sent to the 3rd floor above where the NSA civilian traffic analysts worked wtih them. I was told that there were CIA folks on the third floor also. There was a phone system that could directly communicate with the White House. An electrified double-fence encircled the site with armed guards with dogs walking the fence perimeter and out into the surrounding woods. Two times during my tour I was tagged for courier duty which entailed transporting sensitive documents generated from this site and another nearby smaller listening site in Berlin. Myself and another courier carried the material through the night on a passenger train through East Germany and delivered them to the Security Agency’s headquarters in Frankfurt, West Germany the next morning. The duty assignment was always for one round trip a week for four weeks to and from Frankfurt and always with someone different so as not to create a noticeable pattern of traffic. It was good duty as there was a lot of time off between trips and were not obliged to do any other duties. Most times we carried nothing back to Berlin except our personal overnight bags. The train was regularly stopped multiple times to and from Berlin during the night while in East German territory by armed East German guards who checked I.D’s and made a head count. They never gave us any trouble but were intimidating with their weapons and their serious demeanor. This is all unclassified now. 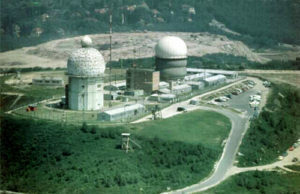 A sign on the now defunct site actually states that it was a cold war American listening station but up until the late 1980’s it was one of the NSA’s largest highly top secret installations in the world. All during the cold war Berlin was a hot bed of active spying and espionage operations largely due to its geographic location deep within the borders of communist East Germany with access to Western Europe. The site and it’s operations were actually compromised in the late 80’s, long after I left, by a Russian-trained East German agent in collusion with an American warrant officer. The cat was out of the bag then. The agent and his American accomplices were caught and imprisoned in the United States. The station was gutted and abandoned in 1991. I retired early from the University of Texas to home school my daughter. Longtime friends and co-workers Matthew and James. Very busy sign shop as we produced most of the in-house sign work on campus. We got to work on some really cool stuff over the years. 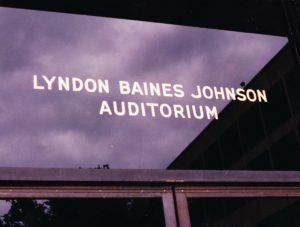 Typical campus sign work before computerized sign making. All institutional signage was plain gothic with some scatterings of styles with serifs. 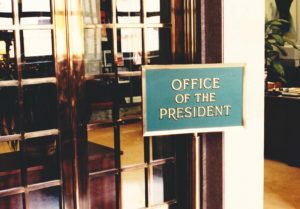 This sign was hand lettered in 22 karat gold leaf in early 80’s. 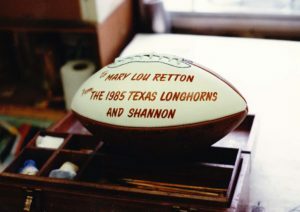 Over the years I did quite a few gift footballs given by the athletic department to certain individuals. Most were for defensive and offense players of an individual game and some were special gifts like this one. Traditionally following the football game with our arch-rivals the Texas Aggies the sign up on the third floor of the main building would be stolen. It was a very expensive cast bronze sign bolted to the wall. We learned not to underestimate them. We came up with this fake sacrificial sign that was displayed on game days. It was constructed so the sign could easily be lifted up out of the frame without tools. It just screamed “steal me”. Cost us about 5 bucks to make and they faithfully stole it. Saved us some bucks and the guards quit trying to catch them. My prized photo. For me this day ranked up there with getting born again, getting married and seein’ my daughter born. 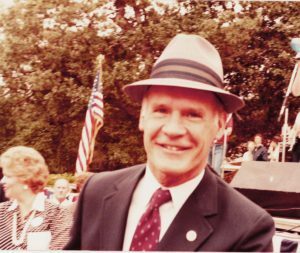 Tom Landry and Maureen Reagan came to UT stumping for Ronald Reagan for President. I got to shake his hand and say hello just after I snapped this photo. His hand was like concrete. You made my day Tom and we miss the Cowboys of your era. That’s Maureen on the left, she too has passed. 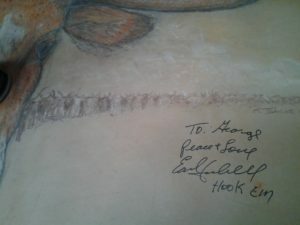 Lower corner of rough sketch of a mural I painted for Earl Campbell’s office. He insisted I sign the mural and I said okay if he’d sign my drawing. I spent a pleasant 3 days in his office painting the mural and yacking with him. This was after Earl retired. They had given him an office with the coaches in Bellmont Hall in Memorial Stadium to do PR work for the athletic dept. Everyday I was there someone would bring in a recruit or maybe some young kids to meet him and Earl talked with them like old friends, signed autographs and gave out football to the kids. Class act and was something to watch when he was playing for the Longhorns and the Houston Oilers. I am indeed an uncle. 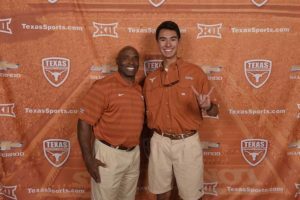 My nephew and UT football coach Charlie Strong. Kevin is a business major in the McCombs School of Business. He will do well. Sorry Charlie…Go Horns! 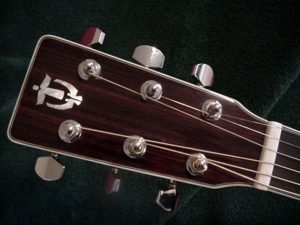 After retiring I ordered a kit from Martin Guitar Company and after about 3 months I finished building a Martin D28. Sounded like factory guitar. Definitely a lesson in patience and precision construction. 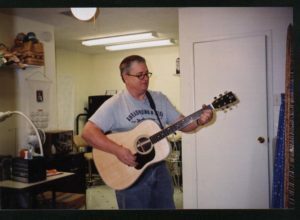 Later I built a Martin D35 and turned out great. Custom mother of pearl inlay I did on one of the tuning heads. The kit doesn’t include the Martin factory badging. I did a similar one on the other guitar in gold inlay. I like to fish for Hybrid Striped Bass when time allows. 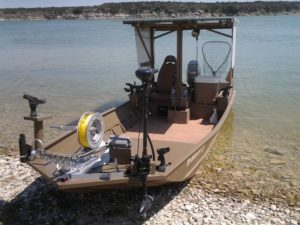 This is my boat that I custom set up just for netting live bait and catching stripers. Powered by only a 40hp Honda outboard it gets me to where the fish are. The aluminum top provides needed shade for me and my bait tank. The off-road suspension seat smooths out the rough ride at times and reclines all the way back for a noon snooze. Very first hip pocket holster I made without a separate back. It was made with leather from Tandy’s with wood glue and no stitching. I am still amazed at how long it held up. It never did come apart. It was for a little .22 caliber Beretta. 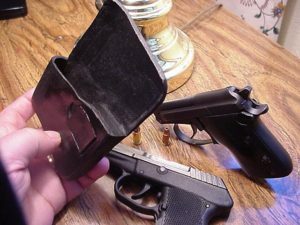 It had an extra little compartment that held 4 extra rounds. The little Kel-tec P-32 that came out later fit the holster also so I started carrying it until the Ruger LCP became available which prompted a new holster.